Seldom you see a Mazda Miata MX-5 as clean as this. This build features a set of our CCW D11L three-piece deep-dish forged wheels. The CCW D11L three-piece modular wheels are constructed from 6061-T6 forged aluminum. The wheels are precision CNC machined for exceptional trueness and beauty, where the inner and outer rims are precision spun for superior trueness and strength. Additionally, these wheels are assembled with racing industry standard ARP stainless steel hardware. In turn, every CCW D11L wheel features not only a gorgeous design but also, but also, a high-quality, lightweight wheel solution offering perfect fitment for each and every vehicle application. The wheels are finished in a striking Polished Gloss finish for both the centers and lips and you’ll be hard-pressed to find a better finishing choice for a black Miata MX-5 build. The most important aspect of our CCW D11L three-piece forged wheels is their modularity. For this particular build, the owner wanted a precision built set of wheels that adhere to its rolled fenders and a coilover setup that allows for an aggressive lowering and a negative camber suspension setup. In turn, this meant that our engineering & design department had to work together to ensure that all engineering aspects are adhered to. This means that requirements like the clearance of the upgraded Miata brake calipers, the rolled fenders, and an ultra-low suspension setup are met with precision and no rubbing issues are to be found. Additionally, the owner is running an aggressive negative camber setup on this vehicle, which requires additional fine tuning as far as the wheel fitment/setup goes. This means that we had to precision-tune the position of the wheel centers, lips and adjust the barrel size, trim off any surplus material on the wheel hub, all to ensure perfect fitment of these brand new wheels for our customer. Consequently, the finished product is a wheel setup that satisfies both the particular customer needs and the additional platform requirements to the fullest, providing the owner with a satisfying final result. While purists will somewhat scoff at the visual result of this project, this is clearly one of the best looking Miata’s out there. Grab a detailed look at this project, added in a high-quality wallpaper sized resolution media gallery right below. 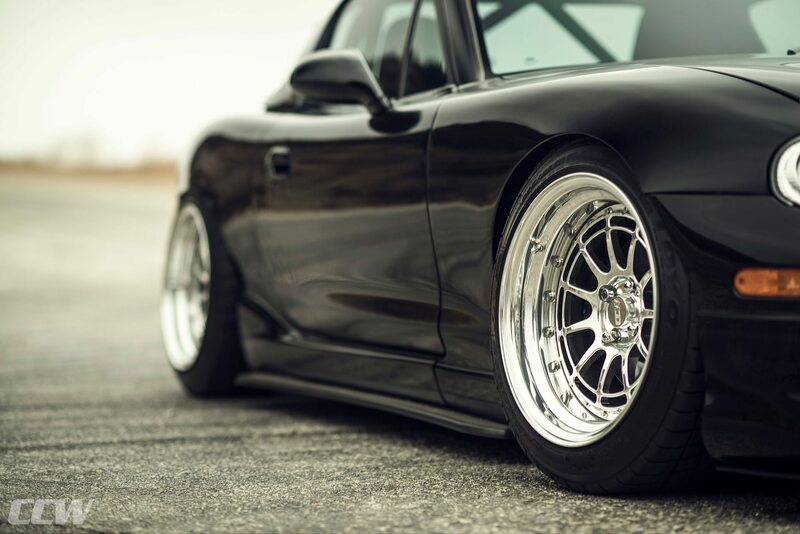 Furthermore, don’t hesitate to contact us to upgrade your Mazda MX-5 Miata’s wheel setup right away.